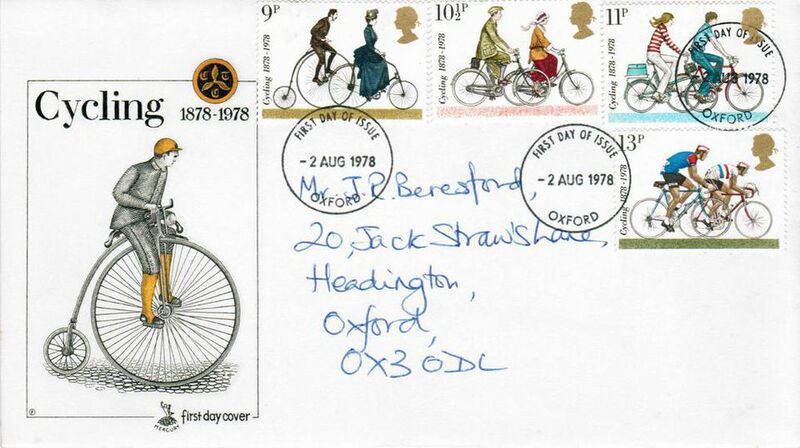 The type of cachet that most collectors are familiar with appears as an illustrative piece of artwork that fills approximately the left third of a first-day cover’s front. Its purpose is to amplify the stamp that appears on its envelope with a pleasing visual whose subject relates to the stamp. Text explaining the stamp’s purpose is frequently included. There are also more elaborate cachets that fill the entirety of the front of the envelope, harking back to the days of the advertising cover, the 19th century, when businesses would decorate their mailing envelopes with elaborate designs. To the stamp collector, a cachet can be more important than the stamp, with work of favored artists attracting loyal followers who must have every cachet produced, without regard to the stamp issue that engendered the cachet. The first cacheted cover was produced by George Linn, publisher and editor of long-running philatelic newspaper Linn’s Stamps News. His simple three line cachet was created for the first day of issue of the President Warren Harding memorial stamp of 1923. In the 1930s first day covers attained a great popularity with stamp collectors, as many cachet makers entered the growing area. The great variety of cachets eventually necessitated guides and catalogs, with the two most relied on by collectors being Planty’s and Mellone’s. The most popular and widely collected of cachets is the Artcraft brand, which entered the scene with the 1939 New York World’s Fair stamp. Any representative collection of first-day covers should have this cover in its collection. Other popular cachets that appeared around the same time and later include Fleetwood, House of Farnam, Flugel, Anderson, and Crosby, among others. Fleetwood, for years produced by the Unicover Corporation, was acquired by the Mystic Stamp Company in 2007. In earlier years, at its height, the company received so much mail at its headquarters in Wyoming that it had its own zip code. The cachet maker Colorano, which began its first-day cover business with America’s Wool issue of 1971 produces what it calls a silk cachet, which is a piece of fabric fused to the envelope and having a satiny or silk-like look and feel. Earlier cachets were often created with rubber stamps, a style that was maintained for the cachets on Contract Airmail (CAM) first flight covers which saw their greatest popularity from the ‘30s through the ‘50s. Cachets of various types are also an integral part of event covers, where early versions also often featured rubber stamp cachets. With these covers, the stamp itself is unimportant, as the event -- fair, expo or civic gathering, airshow, the appearance of a celebrity, a Zeppelin passing over a particular geographic location, etc. -- is the reason for the cover, not the stamp. Patriotic covers of the type used by mailers and collectors during WWII had their day, with stamp dealers and publishers like Jacques Minkus producing a variety of cacheted envelopes with general patriotic themes. These were sold as stationery items at Minkus stamp counters and through mail order and were used extensively by naval cover collectors, who would have them canceled on ships on noteworthy occasions. They can also be found on Army Post Office (APO) cancels. Spurred by the rise of desktop publishing and the spread of quick print shops, many entered the field of cachet making in the ‘80s. A great variety of new -- and often short-lived -- lines of cachets appeared and vanished as do-it-yourselfers tried their hand at offering cacheted first day covers. Some of these cachet makers printed their covers in limited quantity and for a time found financial success, raising the profile of first-day covers by creating so-called handpainted cachets, a term which entered the collector’s lexicon at that time. High prices for these works of cachet art discouraged many collectors. Handpainted cachets are still popular (an eBay search returns over 3,000 results), not the least due to more reasonable prices than in the speculative boom days of the ‘80s.